Coquille City Hall is located at 851 North Central Boulevard, Coquille, OR 97423; phone: 541-396-2115. Photo: Judge Lintner Harlocker House, ca. 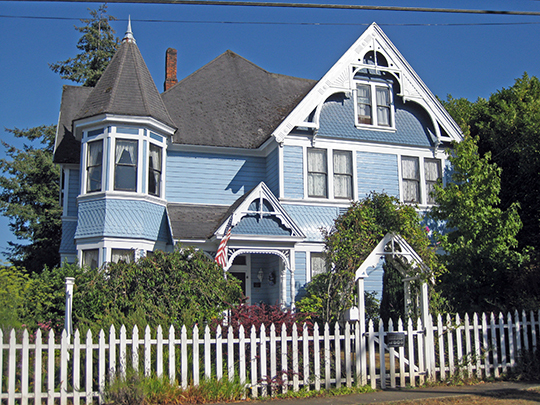 1891, 18 South Collier Street, Coquille, OR. Listed on the National Register of Historic Places in 1992. Photographed by UserZenhaus (own work), 2012, [cc-by-3.0 (creativecommons.org/licenses/by/3.0)], via Wikimedia Commons, accessed February, 2014. The earliest known inhabitants to occupy the site now known as Coquille were the Upper Coquille Indians. These people had villages at the site for thousands of years before the time of the first white settlers and seem to have recognized the significance of the site as a mid-point in the river's course. The first major group of pioneers to arrive in the Coquille River Valley for the purpose of homesteading was the Baltimore Company in 1858. Although they concentrated their settlement on the lands above Coquille, around what is now Myrtle Point, one of their group, Evan Cunningham, located on the site which is now Coquille. He built his cabin in the vicinity of what is now the southwest corner of the intersection of Central and Main and also built the city's first wharf on the river between what is now Birch and Central. As the population table shows, Coquille's population in 1860 was only 94 souls. However, since Coquille was a focal point of early county settlement, Coquille's tiny population represented 21% of the county total in 1860. Coquille's growth for the next twenty years was very slow. In 1870, Coquille had its first postmaster and in 1871, the first store opened above a river landing. In 1872, the original five block plat of the townsite of Coquille was officially established. It extended from the river north to Second Street and from Birch to Adams. It is interesting to note it was platted using magnetic rather than true north so its boundaries are easily identified on current city maps. Although some historians disagree, it is generally accepted that the plat was named "Coquille City" after the river. In 1873, the Coos Bay Wagon Road was completed from Roseburg to the Coos Bay area by way of Sitkum, Dora, Fairview and Sumner. The road established a direct mail route between Empire City (the Coos Bay area) and Roseburg but was too far north of the Coquille Valley to be any benefit to Coquille City. Coquille remained without any roads beyond its twelve block area. A crude trail connected Coquille and Myrtle Point, and a trail along the north bank of the river to Beaver Slough, and the river itself, connected Coquille with the Coos Bay area via the Beaver Slough-Portage-Isthmus Slough route. Coquille was still a river-dependent community. It had been born on the river, it had grown from the river and the river was still its primary means of transportation. By 1880, when the city's first sawmill was established, Coquille's population had reached only 176 and had declined to 4% of the county total. The decade of the 1880's saw the first real growth in Coquille's population. This was due in large measure to the completion of a wagon road between the Coos Bay area and Coquille in 1884. This road permitted an overland mail route and dray enterprise between the two cities. Construction of this road was the first step in the shift of Coquille's transportation "lifeline" from the Coquille River to land. By 1890, Coquille's population had reached 494, nearly triple that of a decade earlier. The decade of the 1890's brought both destructive and constructive events for the fledgling city. On the night of May 31, 1892, a fire began in the Band Hall on the corner of Birch and Main. Since the fire started in a section of the business district which consisted of wooden buildings, connected by wooden walks, the fire quickly spread through the entire business district, eventually jumping streets and consuming most of the business district above the city wharf. This fire effectively destroyed over 75% of the city's commercial business district. In 1893, the Coos Bay, Roseburg and Eastern Railroad extended its line from the Coos Bay area to Coquille and then on to Myrtle Point. Although originally planned to connect the Coos Bay area with Roseburg and the Portland-California rail lines, the Roseburg and Eastern Railroad line was never extended beyond Powers. Mr. Albert Powers extended the line from Myrtle Point to Powers and beyond for logging purposes. In 1896, the Coos County courthouse and seat of county government was moved from Empire City to Coquille. This move ended a twenty year struggle between Coquille and the Coos Bay area for control of the county seat. Although the struggle was bitter, Coquille eventually won for two reasons. First, it was the only city in the county which was connected with the remainder of the county by three methods of transportation: roads, railroads and water. Second, Coquille was centrally located within the county and satisfied the contemporary standard often applied to the siting of county seats: the county seat should be within "a day's ride on horseback" from any point in the county. Between 1900 and 1920, Coquille's population increased 125%. Agriculture was emerging as a significant economic force and the timber industry was expanding with the construction of new mills. However, this growth from 1900 to 1920 was small compared to the growth from 1920 to 1930. The decade of the 1920's has been referred to as Coquille's "boom" or "golden" years. Coquille's population increased 66%, from 1,642 in 1920 to 2,732 in 1930, and reached a high of 10% of Coos County's total. The decade of the 1920's also saw the completion of Coquille's transition from water to land transportation. In 1921, the Roosevelt Highway between the Coos Bay area (Marshfield) and Coquille was officially opened. The following year the Coquille bridge was constructed, connecting Coquille with Bandon along the south bank of the Coquille River. This highway rang the death knell for the riverboats which plied the Coquille River. By the latter part of the 1920's, Coquille was firmly established as the county's transportation "hub". All principal north-south and east-west roads in the county passed through Coquille. The depression of the 1930's saw Coquille's growth come to a halt. Lumber production was curtailed and the area's economic base suffered from depressed prices. Coquille probably did better than most U. S. cities during this period. It suffered its hardships and reduced income but it emerged from The Depression years relatively unscathed because of its independent, rural, agricultural-based economy. After World War II, Coquille's economy blossomed with the post-war demand for lumber products and the inflation which followed the conflict. Although cities along Coos Bay to the northwest were larger, Coquille still enjoyed the prestige and importance of being the county's land transportation hub. The city and its surrounding area were based on a timber products economy and the future seemed rosy. A major change occurred in 1954 when the Bandon bridge opened and permitted direct Highway 101 access between Bandon and Coos Bay. Although its effects were not immediately felt, this cut-off had a major effect on Coquille's share of tourism, the county's fastest growing source of revenue. Tourism would become a major element of the county's economy in the future and Coquille was, in effect, cut-off from most of this revenue because Highway 101 is the predominant tourist route in the county. Coquille's dependence on the lumber market was shaken in the 1980's when lumber prices plummeted. Although these prices have recovered, the recent controversy about the Northern Spotted Owl and environmental concerns over old growth logging have placed Coquille's economy in further jeopardy. In 1991, work began to reroute Highway 42 along the western periphery of Coquille, then along Main Street by the river. No history of Coquille is complete without a brief mention of the competition which has existed between Coquille and the Coos Bay area for industry and governmental services. Coquille was the focal point of early county settlement and rose to prominence as the county's transportation center, eventually reaching 10% of the county's total population. Coquille was successful in attracting the county seat away from the Coos Bay area and it remained dominant in county transportation for thirty years. Although it has retained the county seat, it has lost its transportation and industrial dominance to the Coos Bay area. The relationship between Coquille and the Coos Bay area has changed from one of competition to one of cooperation and mutual dependence. Coquille needs Coos Bay's deepwater port, industries, and federal and state governmental services. The Coos Bay area is dependent upon Coquille because, even though Coquille is no longer a transportation center, Coquille still serves as the "gateway" for products from the majority of the county to the east and south of the Coos Bay area. Steve L. Clay, AIA and Carl Sandstrom, Crow/Clay and Associates, Coquille Historic Resources, nomination document, 1991, National Park Service, National Register of Historic Places, Washington, D.C.